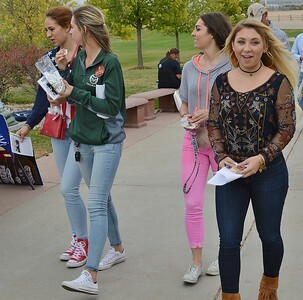 Images of Donald Trump supporters in line for a Trump campaign rally and anti Trump protesters, in Loveland Colorado. 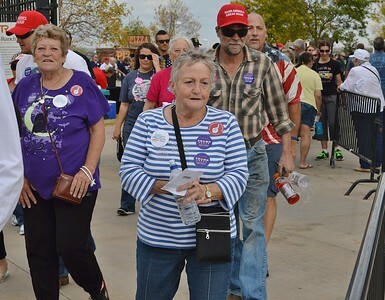 Senior woman wearing Donald Trump stickers, in line for a Donald Trump rally, other Trump suppoters in line behind her. 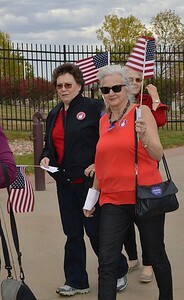 Two women carrying American flags in line for a Donald trump rally. 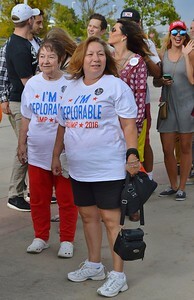 Two women in line for a Donald Trump rally weraing "I'm Deplorable" shirts. 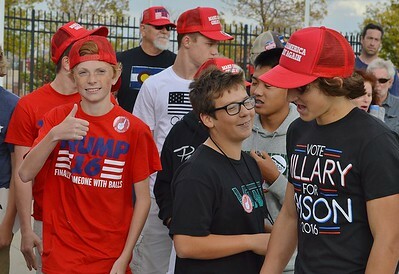 Young boys wearing Donald Trump hats and shirts. One gives the "thumbs up" another wears a "Hillary For Prison" shirt. 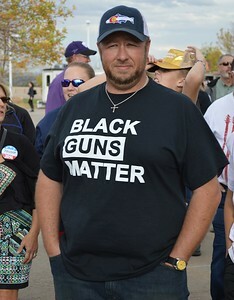 Man in line for Donald Trump rally wearing t-shirt that says "Black Guns Matter". 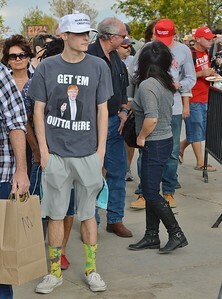 Young man wearing a "Get'em Outta Here" shirt depicting Donald Trump, stands in line for a Trump rally. 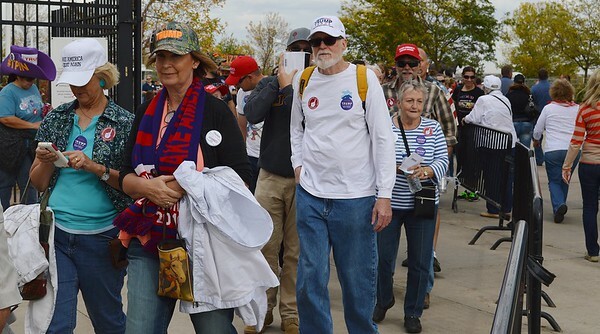 Donald Trump supporters wearing campaign hats, shirts and buttons, in line for a Donald Trump rally. 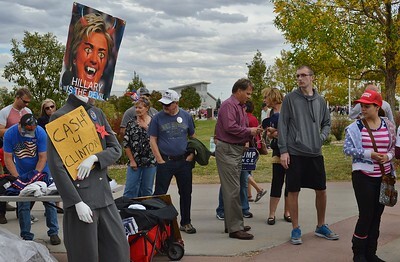 Donald Trump supporters in line for a rally, turn to look at an anti Hillary Clinton poster portraying her as the devil. 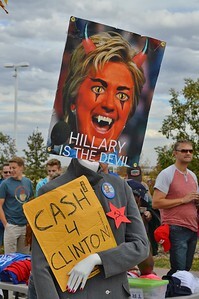 Anti Hillary Clinton poster portraying her as the devil. 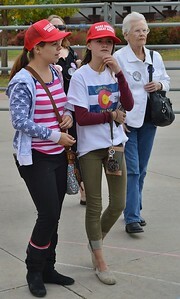 Two young girls wearing Donald Trump hats and shirts, in line at a trump rally. 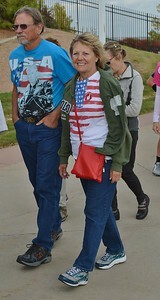 Man and woman in line for a Donald Trump rally, man wearing t-shirt depicting Trump on a motorcycle. Man wearing U.S. Navy veteran hat and anti Hillary Clinton t-shirt, in line for a Donald trump rally. 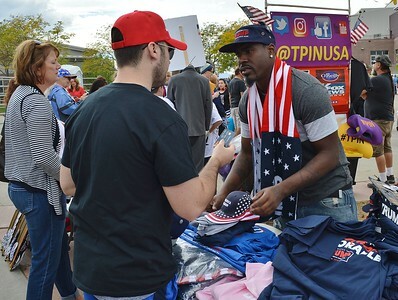 Vendor at Donald Trump rally, standing ion front a of a table of merchandise, sells campaign items to a Trump supporter. Vendor is wearing a Trump hat and American flag/Trump scarf. 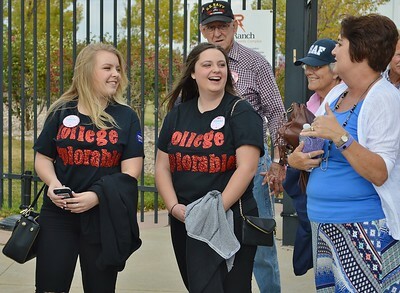 Two young women wearing "College Deplorable" shirts, talking to other Donald Trump supporters in line for a rally. 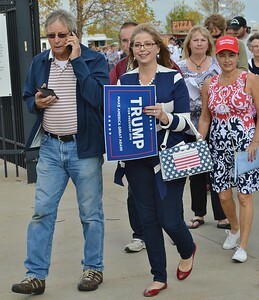 Woman holding Trump For President sign in line at a Trump rally. 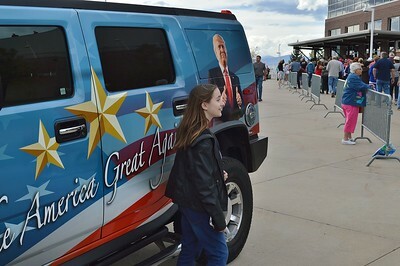 Young girl posing for a picture in front of a van with large picture of Donald Trump on the side. 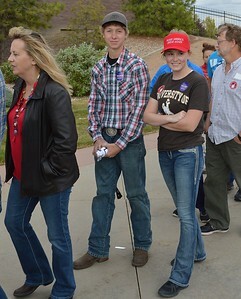 Two young Donald Trump supporters in line for a rallty. 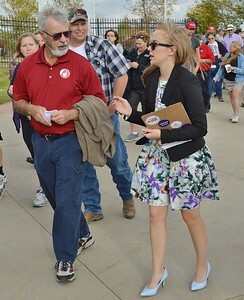 Young Donald Trump volunteer holding a clipboard, talks to a man in line for a Trump rally. 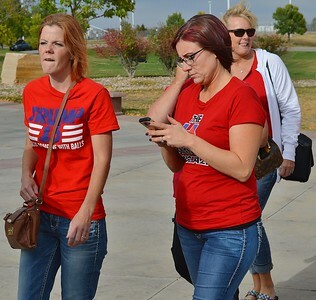 Two women in line for Donald Trump rally, one looking at cell phone, other wearing a Trump t-shirt. Group of young girls in line for a Donald Trump rally. 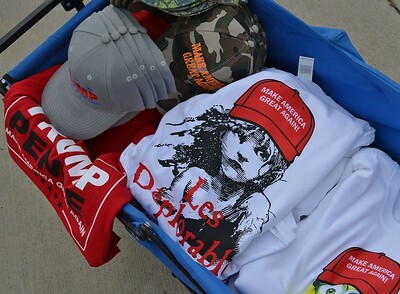 Table of Donald Trump campaign merchandise including shirt with drawing of "Les Miserable" character wearing Trump hat. 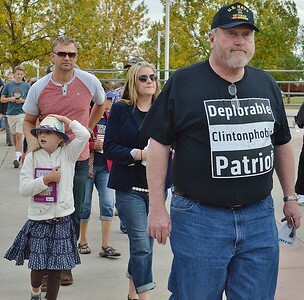 Slogan on shirt says "Les Deplorables". 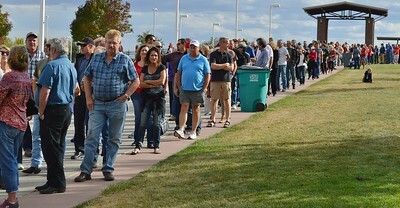 Long line of Donald Trump supporters in line for a campaign rally in Loveland Colorado. 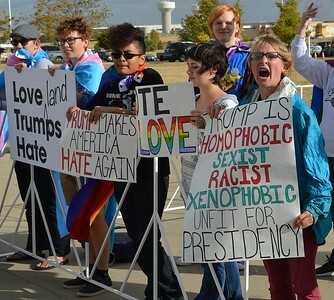 Group of anti Donald Trump protesters holding signs outside Trump rally. 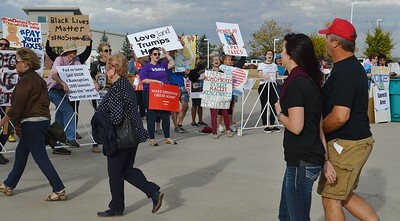 Donald Trump supporters walk past a line of anti Trump protesters outside Trump rally in Loveland Co.
Anti Donald Trump protester holding sign with quote from the Bible on it, outside a Trump rally. 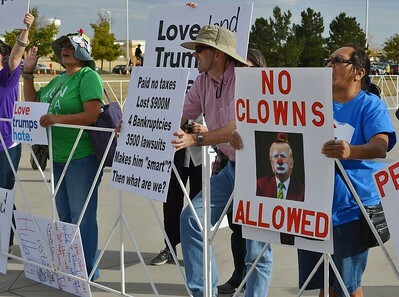 Anti Donald Trump protesters with signs including one with picture of Trump in clown make-up. 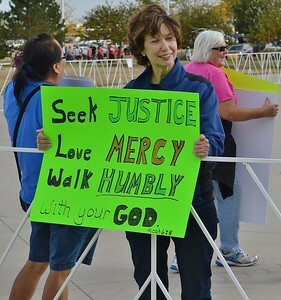 Anti Donald Trump protester holding sign and shouting, others with signs next to her. 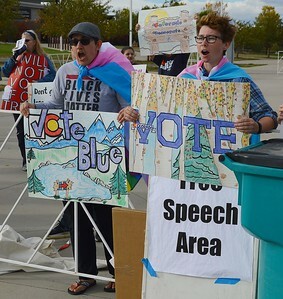 Two young anti Donald Trump protesters hold signs about voting outside Trump rally. 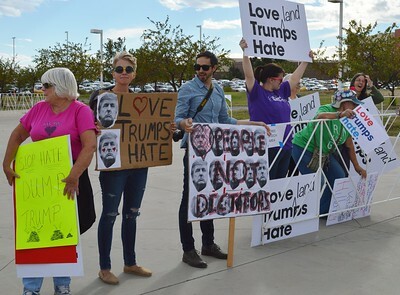 Line of anti Donald Trump protesters with signs, outside a Trump rally.